Sometimes you just need a super-simple idea. You don’t have time to make a game. You don’t want to get out the craft supplies. But, you do want to do a fun learning activity with your kids. 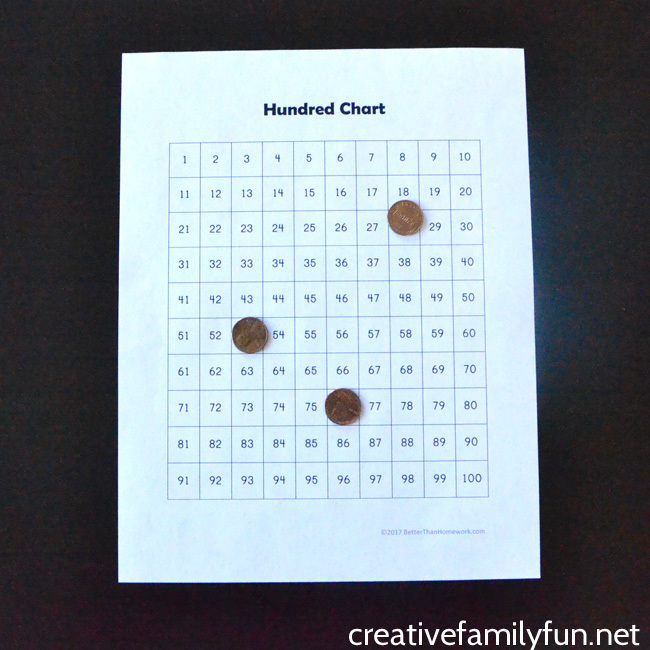 This simple Hundred Chart Hidden Number Game is perfect for those days when you just don’t have the time to prep an activity. Just print it out and grab some loose change. You’re ready to go. And then, when you want to have more fun with math, you can check out all the rest of our Awesome Hundred Chart Activities here. 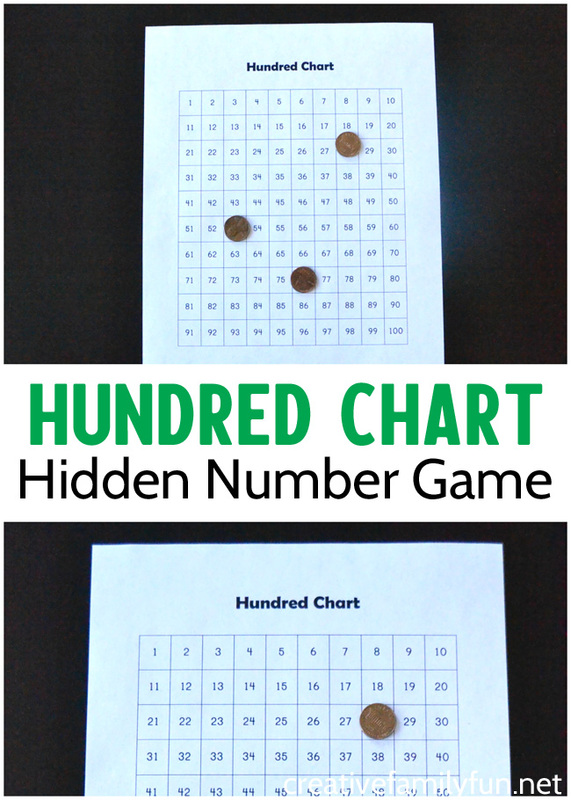 This Hundred Chart Hidden Numbers game will help with number sense. Your child will need to look at the surrounding numbers to figure out the hidden number. You’ll need a hundred chart. You can get one using the link below. Feel free to save it to your computer and use it whenever you need a hundred chart. Click this link for your printable hundred chart. Grab a few pennies from your change drawer and you’re ready to go. Cover up one of the numbers on the hundred chart with a penny. Ask your child to guess the hidden number. They’ll need to look at the surrounding numbers to guess. What’s the number before the penny? Can you count up to find out the missing number? Also, show them how they can count backwards to find the number or use skip counting by ten to figure out the number. 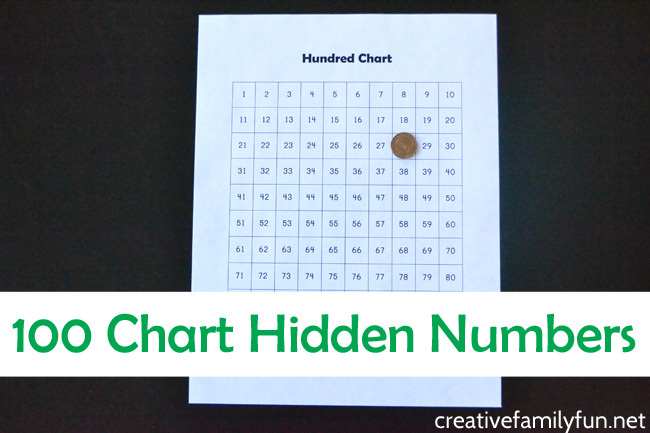 Make this hundred chart hidden number game harder by covering up multiple numbers. Use as few or as many as you want. This game would work great with two or three kids. Have the kids take turns covering up numbers for each other. Cover a whole chunk of numbers. Can you child figure out all the numbers that are hidden? Just remember, learning activities don’t have to take a lot of work. 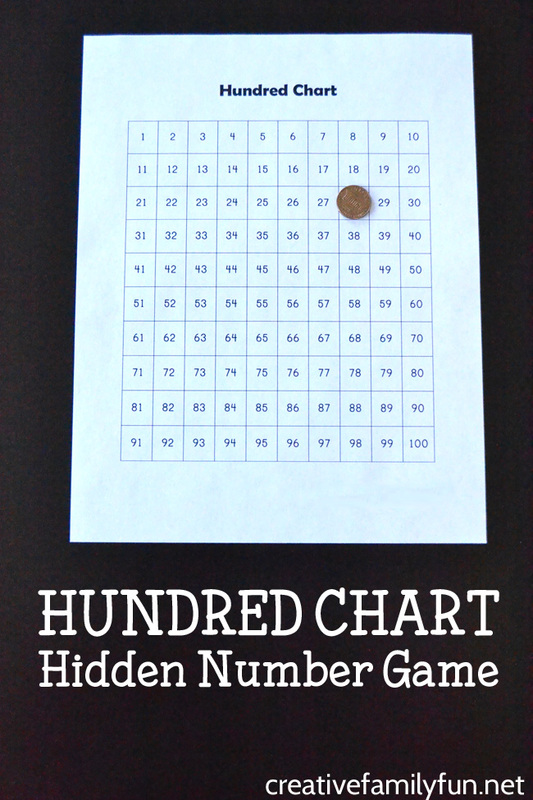 Sometimes all you need is a super-simple idea like our Hundred Chart Hidden Number Game. You can find some great hands-on hundred chart toys to extend the fun. Try a sturdy and fun hundred chart with removable numbers or put up a large hundred chart with pockets. Or, you can get a hundred chart play mat for the floor. Check out all the fun resources I found below.